Supported by Northern Ireland Tourist Board, the Arts Council of Northern Ireland, Belfast City Council and Iris Colour, Belfast Photo Festival - which runs from 6-30 June - will immerse the city in a dizzying variety of exhibitions, screenings, workshops, book launches, walks, talks, master classes featuring some of the biggest global names in photography as well as the brightest and best photographic talents from these islands. This year's festival theme of "Spectacle" runs strongly throughout the festival programme of startling, beautiful and often acclaimed exhibitions, throughout some of the most interesting venues in Belfast's landscape. Making waves at the Festival...is Revisit by Doreen Kennedy which runs at the Disability Arts Forum from June 7 – 30. Artist Doreen presents a photography-based installation, themed around the external environment and the process of recording time using single or repeated images. The exhibition will include 'Flower Bed' and the more recent 'Sea Bed' installation funded via the Arts & Disability Awards Ireland scheme managed by the ADF on behalf of the two Arts Councils of this island. 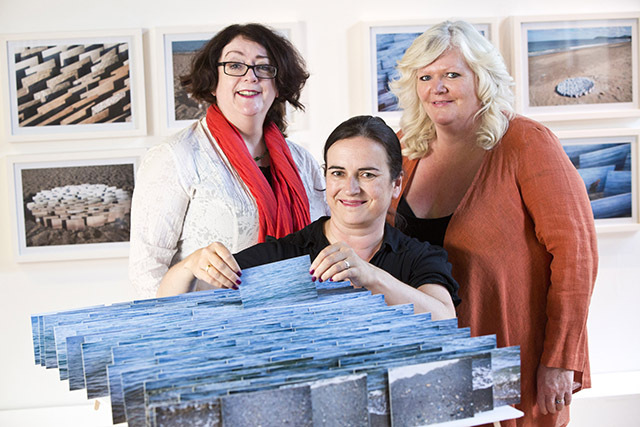 'Sea Bed' is a three-dimensional seascape that was installed on Killiney Beach and documented over the course of a day. Also included in this year’s festival are Cédric Delsaux's range of Star Wars characters in counter-intuitively urban settings in Dark Lens, Helen Sloan's startling On-Set exhibition of never-before-seen stills from HBO's Game of Thrones, the programme combines the epic with the intimate to create a real treasure trove of photography and related events, accessible to all throughout the city. Belfast-based film stills photographer Aiden Monaghan offers his own sample of behind-the-scenes moments from cinema and TV recently shot in Northern Ireland. German photographer Mirko Martin showcases his disturbing, unforgettable collection In Broad Day, which offers snapshots of downtown LA that in colour, intensity and theatricality seem lifted straight from a Hollywood film set. The visually staggering Stage exhibit by Taiwanese photographer Shen Chao-Liang, featuring a series of specially shot Taiwanese "truck theatres", has to be seen to be believed. The internationally renowned Roger Ballen, hailed as one of the most important photographers of his generation, not only exhibits Edge of the Real in Golden Thread Gallery but also, thrillingly offers a master class in the process of making photographs, reviewing and critiquing works. Catch up with 30 years of Northern Irish Photography courtesy of Belfast Exposed in their absorbing exhibition in The MAC. Local exhibitions maintain the spectacle with some impressive exhibits across the city. Sarah O'Gorman's site-specific installation at the unique PS2 gallery involves the projection of a series of haunting 35 mm slides, while Strawboys at Culturlann - featuring work by Jim Maginn and Gráinne Quinlan - illustrates a rich centuries old Irish tradition of performance, theatre and entertainment with masks, costumes and assorted paraphernalia. Spectacle is the figurative and actual name of the giant exhibition on rotation on Belfast City Hall's famous big screen during the festival. Australian Time machine Magazine will showcase their striking 2nd issue on the big screen, featuring a world of technicoloured wonder - from a south Sudanese beauty pageant in suburban Melbourne to fetishism in horse racing. Passers-by, photography fans and city hall lunch timers alike will be able to enjoy Spectacle in what will be Belfast's first ever large scale outdoor photo exhibition! Throughout the ten days there will be workshops, film screenings, portfolio reviews, tours, talks by, out of the exhibiting artists and live events, which offer participation and enjoyment of the photographic medium and Northern Ireland’s rich photographic heritage. Belfast Photo Festival Director Michael Weir said: "For 2013 we have endeavoured to programme a Festival with a diverse range of photographic exhibitions and events that appeal to a wide range of tastes and offer something for everyone. Under our 2013 theme of Spectacle, we aim to present some of the most eye catching photographic imagery and celebrate the photographic achievements of some of the finest photography from Northern Ireland and abroad."